Pete Seeger, a seminal figure in American music who kept folk music alive and influenced generations of musicians from Bob Dylan to Bruce Springsteen, died Monday of natural causes in New York, his grandson confirmed to The New York Times. Seeger was 94. 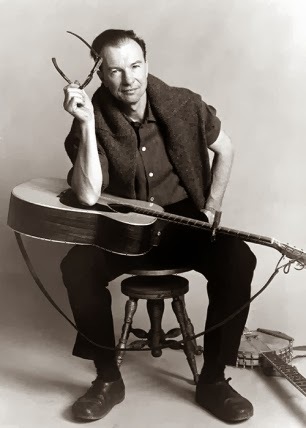 As a solo performer, songwriter, interpreter, and member of the legendary folk band the Weavers, Seeger brought traditional and political songs to the mainstream over the course of his 70-year career. He wrote or co-wrote "If I Had a Hammer" (a hit for Peter, Paul and Mary) and "Where Have All the Flowers Gone?" (made famous by the Kingston Trio). The Byrds had a Number One hit with "Turn! Turn! Turn!," which Seeger had adapted from the Book of Ecclesiastes and set to music. In Seeger hands, songs from Cuba ("Guantanamera") and South Africa ("Wimoweh") became beloved sing-along standards around the world, and "We Shall Overcome," a traditional gospel song that Seeger heard early in his career, was a regular part of his repertoire and a staple of civil rights rallies for decades to come. Although Seeger never scored a Top 40 hit on his own, the charts were never an indication of his overwhelming impact. His massive influence on music and message was never more obvious than at his 90th birthday concert at Madison Square Garden in 2009. Among those paying tribute to Seeger were Springsteen, Joan Baez, John Mellencamp, Dave Matthews, Emmylou Harris, Tom Morello, Ben Harper and Billy Bragg. "The history of Pete's life is the history of music changing the world," Tom Morello told RS in 2007. A tall, strapping figure known for his crisp-as-a-mountain-stream singing and banjo playing, Seeger was also a walking, talking, strumming embodiment of the connection between folk song and leftist politics. Throughout his career, he participated in pro-union and civil rights events and protested wars and nuclear power. For his trouble — and his membership in the American Communist Party — Seeger was blacklisted by the House Un-American Activities Committee in the Fifties; to make ends meet, he had to play sometimes four concerts a day, for $25 each. "I still believe the only chance for the human raced to survive is to give up such pleasures as war, racism and private profit," Seeger told RS in 1979, beliefs he held until his death. Born May 3rd, 1919, in New York, Seeger had music and politics in his blood from the start. His father, Charles Seeger, who died in 1979, was an ethnomusicologist who taught at Yale and Julliard and was a very vocal critic of World War I. Although Pete attended preppie boarding schools, he discovered the banjo as a teenager and, after dropping out of Harvard in the late Thirties, worked for folklorist Alan Lomax in cataloguing and preserving traditional songs. Over the next few years, Seeger and other friends in New York formed the Almanac Singers, living in an early version of a commune in Greenwich Village. During this time, Seeger met and befriended Woody Guthrie, another member of the short-lived Almanacs. In 1948, Seeger, along with Ronnie Gilbert, Lee Hays and Fred Hellerman, formed the Weavers. With their suits (the men), pearls (Gilbert), and smooth harmonies, the Weavers weren't remotely rough and tumble. But that merger of folk and polish allowed them to connect with a mass audience: Their version of Leadbelly's "Goodnight, Irene" went on to sell a then-astonishing two million copies in 1950. The group's repertoire also included "Wimoweh" and an Israeli folk song ("Tzena, Tzena, Tzena"); it could be argued that the Weavers, in their way, invented world music. The Weavers' heyday didn't last long. Along with many others in the entertainment world, the group was blacklisted by the HUAC "anti-communist" witchhunt in 1952, which crippled the group financially and creatively. They reunited three years later, but Seeger left in 1958 after he refused to join them in a cigarette commercial. Seeger himself was found guilty of contempt (he refused to answer questions about his political beliefs at a HUAC hearing in Manhattan). "Dangerous Minstrel Nabbed Here," blared a New York Post headline, although Seeger's conviction was overturned on a technicality a year later. Thanks to the publicity from his conviction and a new contract with Columbia Records (the latter courtesy legendary A&R man John Hammond), Seeger's career and influence kicked back in during the Sixties. Dylan, Baez, Judy Collins and Peter, Paul and Mary were among the many new folk and socially conscious acts of the early 1960s who idolized Seeger. Songs like "Waist Deep in the Big Muddy," about the Vietnam War, showed Seeger still refused to shy away from politics in song. He was also incredibly prolific: Even before he left the Weavers, Seeger began recording on his own, and over the following decades, he released dozens of collection of folk ballads, children's tunes, and labor songs, along with guitar and banjo instructional discs and classic live albums like 1963's We Shall Overcome, recorded at Carnegie Hall. The stage, not the studio, was Seeger's natural home. From the beginnings of his career, when he traveled around the South, Seeger was equally at home singing for African-American kids, summer campers, college students, and Colbert Report audiences (he appeared on the show in the summer 2012). Onstage, Seeger effortlessly wove together his vast repertoire of international songs, stories about his life, and his trademark audience sing-alongs. Seeger was never strident — a key to his longtime popularity — although he notoriously lost his cool at Bob Dylan's infamous Newport Folk Festival appearance in 1965. Seeing Dylan perform with an electric backup band, Seeger was incensed — either at the electricity or the overwhelming volume. (According to legend, Seeger grabbed an axe and tried to cut the cables, but others have disputed that account.) Later, Seeger called Dylan's performance "some of the most destructive music this side of hell." Offstage Seeger helped clean up the Hudson River with his Clearwater Project, which began in the late '60s. In recent years, Seeger — who lived with his longtime wife Toshi at a house he built in New York's Hudson Valley — slowed down, but barely. He continued to record and tour. (In 2012, he released not one but two albums, one of them a tribute to Guthrie.) He also appeared at an Occupy rally in 2011.